Elevate traditional apple pie with this refined take on the classic. 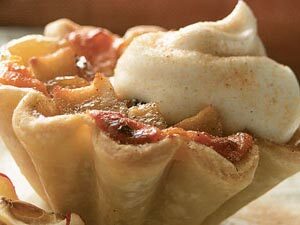 Individual apple tarts are enhanced with the addition of cheddar cheese and apple brandy-infused sour cream. The end result fits the current trend of tempering sweets with a bit of savory. 1. For dough, combine flour, salt and sugar in a large bowl. Cut in cold butter until mixture forms peanut-sized pieces. Add cold water and work by hand to form a soft dough. 2. With floured hands, shape dough into a flat square and refrigerate at least 1 hour. 3. Roll dough into 1/8-in.-thick sheet, using flour to keep it from sticking. Cut into 12 rounds, 5 3/4-inches each. 4. Spray 3-inch round, 1 1/2-in. deep molds with cooking spray and dust with flour. Fit each dough piece into a mold. Refrigerate 1 hour. Trim excess dough so it rests flat with rims. Reserve in refrigerator. 5. Prepare apple-raisin mixture: In large saucepan, combine all ingredients except 5 tablespoons lemon juice, cornstarch and cheddar. Cook over medium heat until apples just begin to soften. 6. In small bowl, blend lemon juice and cornstarch. Add to apple mixture and mix well. Cool in refrigerator. When cool, fold in cheddar; reserve. 7. For brandied sour cream, combine all ingredients in a bowl; reserve in refrigerator. 8. For cinnamon sugar, combine ingredients in a bowl; reserve. 9. To assemble, preheat oven to 375 F. Blind bake the tart crusts by lining dough surface with foil and weighing each down with ¼ cup pie weights or dried beans. Bake 10 minutes or until crusts begin to brown. 10. Remove weights and foil. Fill each tart shell with an equal portion of apple-raisin mixture. Bake about 20 minutes, until filling bubbles and crusts are golden. 11. To serve, place 1 tartlet in center of each of 12 plates. Top with a generous spoonful of brandied sour cream and sprinkle liberally with cinnamon sugar.